Napoli in Italian, Naples is the third largest populated city in Italy and the biggest city in south Italy. Naples is popular for its creative and chronological treasures as also narrow zigzag streets with small shops. Many leading celebrities chose to spend their time creatively amidst the beautiful scenario in the city of Naples. Created between the 6th and 7th century B.C. by the Greeks Naples was then called as Neapolis (new location). From then on Naples has been rules over by many sets of people and lastly was taken over by Romans; traces of all cultures can still be seen in the city. Naples is the birthplace of pizza margherita, that is made of mozzarella cheese, tomatoes, and basil which is a symbolic representation of the red, white and green of the Italian flag. Read on to learn more holidaying in Naples Italy. Naples is located in the Campania region in the south of Italy, situated about 2 hours drive from Rome. Naples Italy stands on the northern edge coast of the Bay of Naples and is one of the most stunning bays in Italy. Naples Italy is well known for its cultural and historical significance. There are many places that speak of the rich cultural and historical heritage of Naples Italy. National archeological museum: Greek and Roman archeological finds are kept on display here. The collection includes rare gems, mosaics, sculptures, glass and silver ware. Also of interest is the Roman erotica collection from Pompeii. San Martino museum: It is in a wonderful Carthusian monastery of San Martino, this place portrays the wonderful Neapolitan art and culture. Capodimonte museum and gallery: Open from 1950, art work from the 13th to 18th century is housed here. Various art works of famous and renowned artists are on display too. Royal palace museum: This museum houses all the belonging of the 17th century Royal palace. The Palace chapel displays an assortment of "Palace's sacred art'. Cathedral-Duomo: Dedicated to Naples saint San Gennaro, this is a 13th century Gothic cathedral. A 4th century Basilica, a Renaissance crypt and baptistery is also found here. The Basilica is one of the oldest churches in Naples. There are various other cathedrals of interest in Naples such as Church of San Lorenzo Maggiore built in the 13th century, Church of Santa Chiara built in 1300, Church of Gesu Nuovo, Church of San Gregorio Armeno built based on the Neapolitan art etc. These churches are pieces of architecture that speak of the rich and varied culture of Naples Italy. Castel dell'Ovo: Located in the harbor, this is one of the oldest castles of Naples and is mainly used for concerts and exhibitions. It was built in the 12th century. The Royal palace and gardens: Built in 17th century the palace is designed in the renaissance style and was home to Spanish viceroys. Castles such as Reggia di capodimonte built in the 1738, Castel Maschio Angiolino built in the end of 13th century, and Castel Sant'Elmo a six-point star shaped building built in 1329 speak of the past dynasties of Italy. Spaccanapoli: This place is the heart of the historic center and is one of the major streets in Naples. Many places of interests can be found on this street - churches, shopping options and old buildings. The narrow and zigzag streets here make it a wonderful experience to just walk or stroll around. Places such as Vomero houses museums and monuments and is one of the most peaceful area of the city, Via San Gregorio Armeno is a street very popular as the 'nativity scene road'. Posillipo Hill, underground Naples, Piazza Bellini etc are also places of interest within the city. 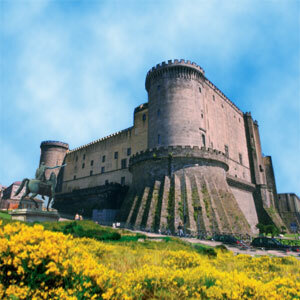 Castel Nuovo: Currently housing the civic museum, this castle was erected during 1282 and is a very huge one. The summers are hot and winters mild, an archetypal Mediterranean climate defines Naples Italy. The mild climate made this place an all time favorite holidaying place for the erstwhile Roman emperors. There are plenty of hotels to stay in at Naples; there are apartment facilities, camp sites, and rural farmhouse accommodations available too. Naples serves as the key transportation hub in southern Italy; it is well connected by main train lines. Bus and train stations are in Piazza Garibaldi in the east of Naples. Naples Italy also has an airport, Aeroporto Capodichino, connecting Naples to the rest of Europe. There are ferry and hydrofoil services to other islands in Italy.